In my pocket I have a weapon. A secret weapon. 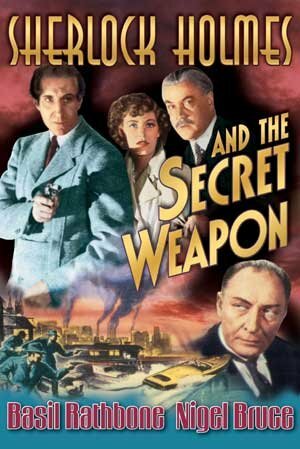 A weapon so secret and so sinister, 'Universal' actually made a 68 minute movie about it in 1942. It was Directed by: Roy William Neill; and Starred Basil Rathbone, Nigel Bruce, Dennis Hoey, with Lionel Atwill. You have been duly warned. Hey, Watson (Nigel Bruce)! You never guess what's happened to that scientist I help smuggle out of Switzerland? You know. That foreign looking chap who demonstrated his top-secret explosive-apparatus to the British Army. Doctor Franz Tobel (William Post Junior). Huh? How did you know some unscrupulous character had the audacity to kidnap him? Oh! Inspector Lestrade (Dennis Hoey) told you, did he? Ah-huh! Fair enough, old chap. Although I suspect he didn't tell you that his abductor was none other than our old arch-nemesis, Professor Moriarty (Lionel Atwill). Franz's girlfriend Charlotte Eberli (Kaaren Verne) told me this a few moments ago. She looked up at me with those dark sultry eyes of hers, and said, 'Sherlock Holmes (Basil Rathbone). Franz is nowhere to be seen. What's more, he's left behind a very strange note that he told me to pass onto you, just in case anything should happen to him'. But then again, that's most probably why what next transpires all blows up in my face when I pretend to be a sailor. As Moriarty looks past my disguise - a secret code word looks us square in the eyes - a diffused weapon is divisible by four - and at the end of the day, a bad-guy ultimately falls down hard upon a concrete floor. 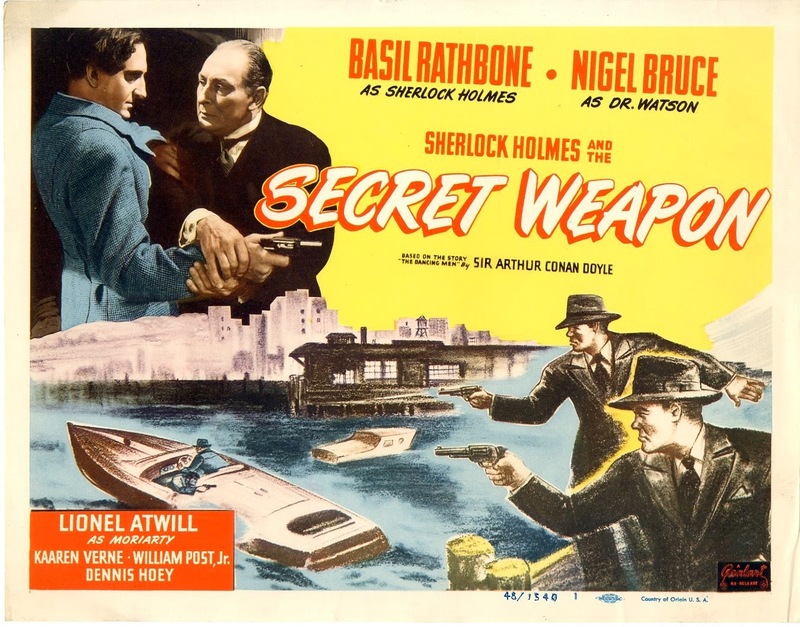 Once again, dear reader, I have to say 'The Secret Weapon' was one hell of a brilliant Sherlock Holmes film to sit down and watch. From my point of view it had that great war-time feeling of dread and fear looming over it. And this in turn was greatly enhanced with the usual well polished acting, set design, and of course, cast of characters. Admittedly, where the overall narrative was concerned the structure of this piece was progressively lopsided in places. It began with Sherlock smuggling Tobel out of Switzerland and away from the Gestapo. And it then progressed by explaining why Tobel was taken to England, as well as setting up that something was bound to happen to him by parties unknown. At this point, though, the story's emphasis changed slightly. Changed from a 'What will happen next?' type tale, into a 'Sherlock Verses Moriarty' type tale. With the noted emphasis again being on how Sherlock can retrieve Tobel from his vile villain. Now don't get me wrong. This isn't necessarily a bad-bad thing. Tonally this departure was reflected in how the plot then progresses. For instance, I loved those scenes where Sherlock and Moriarty faced off against each other, where each of them got the opportunity to tell their opponent how they felt. Honestly, folks. These sections had a real personable yet sinister vibe. Particular that penultimate scene where Holmes explained to his old foe how he would end his life, even though while he was doing this, this role was drastically reversed. Ha! Also, something else about this movie I got a right kick out of was how Watson and Lestrade worked off of each other. Straight up! They almost seemed like a double-act within a double-act. With each of them being a counter-point to themselves and Holmes, whilst commenting on Sherlock's antics of dress-up and deductions. Oh! And while I'm on the topic of Basil playing dress-up, I best mention that on this occasion I wasn't very keen on those sequences where he disguised himself and tried to 'mingle with the locals'. Unlike his attempts in other Sherlock Holmes films, like 'The Spider Woman' for instance, I found Basil's impersonations a mite too obvious in execution. As you could really tell from the get go that Sherlock was in fact Sherlock, but with a splash of paint and a wing draped over his face. Anyway, apart from that slight gripe, by now I'm sure you know how I feel about this marvelous movie. So let's us all now sit-back, relax, and check out the following filmic-facts. (1) 'Universal' first screened this production in Los Angeles, California, on the exact same day the Russian and the German armies had a tank battle at Stalingrad. It was on the 25th of December, 1942. (2) During pre-production, this project was given the working title, 'Sherlock Holmes Fights Back'. (3) Even though this picture clearly states that it was an adaptation of Sir Arthur Conan Doyle's 1903 Holmes story, 'The Adventure of the Dancing Men', I'm afraid to say that it wasn't. The plot is loosely based on a real life historical event which happened after Doyle's death, and only uses a few elements taken from the source material, relating to the 'dancing men code'. 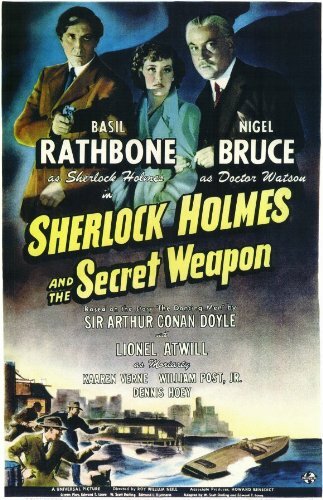 (4) Just like many of the other Holmes movies made for 'Universal', this one was also shot at 'Universal Studios', Universal City, situated within the American state of California. (5) In its own amiable way, this tale has been transposed onto celluloid six times from 1923 to 2010. 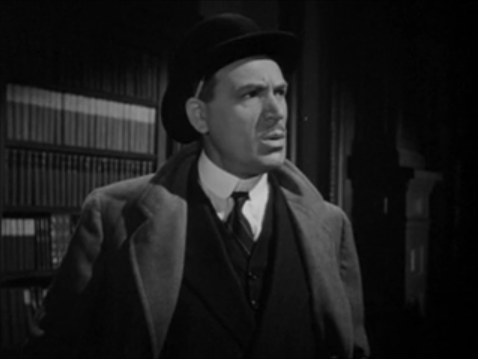 (6) Thankfully, this film marks the first appearance of Dennis Hoey's version of Inspector Lestrade. He would later go on and become a regular player in this series of films, providing much of the light relief along with Nigel Bruce's version of Doctor Watson. (7) Now if you took any notice of my previous fact, you might like to know that this was the first time Roy William Neill directed this series of films. He would also later go on and become its regular director and producer. (8) After this flick shot it's load, Nigel Bruce starred in the historical-drama, 'Forever And A Day'; Lionel Atwill starred in the horror-classic, 'Frankenstein Meets the Wolf Man', and Basil Rathbone starred in the next Sherlock Holmes adventure, 'Sherlock Holmes in Washington'. 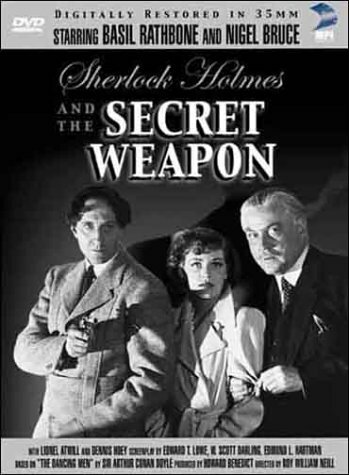 Overall I'd say 'The Secret Weapon' was a splendid slice of Sherlockian cinema. And I would defiantly recommend it to all you Holmes Hounds out there, as those scenes with Sherlock and Moriarty were well worth the price of admission on their own.